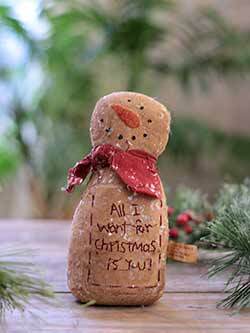 Snowmen galore at The Weed Patch, including ornaments, figurines, linens, and other decorations by Tag, Design Design, Ganz, Blossom Bucket, Seasons of Cannon Falls, ESC (including Lori Mitchell), Janelle Barryman's Pumpkinseeds, Park Designs, and more! 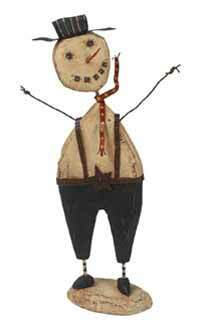 Country, primitive, folk art, contemporary and vintage are all here! 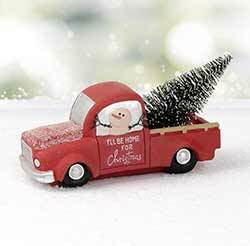 Christmas Blow-out Cupcake Trinket Box, by Ganz. 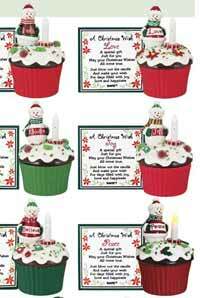 Make a Christmas wish with a blow-out candle topped cupcake shaped trinket box! 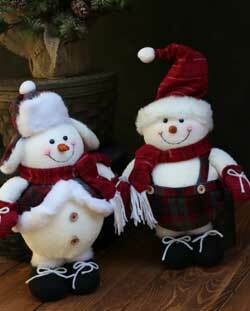 Accented with a cheerful snowman. Switch candle light on, and blow out! 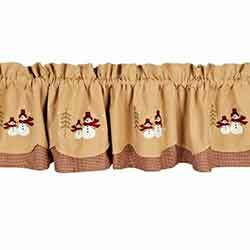 Sold individually from the six designs shown. 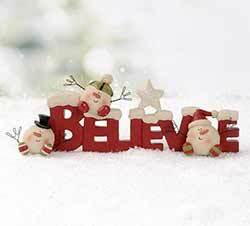 Choose the Faith, Love, Joy, Peace, Believe, or Rejoice Cupcake. Measures 3.25 x 5.5 inches. Ceramic base, polymer top. Requires two button-style batteries (included). On/off switch. 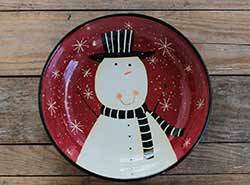 This beautiful country-style Christmas pottery serving bowl features the whimsical snowman artwork of Dan DiPaolo, in a black, white, and burgundy color palette. 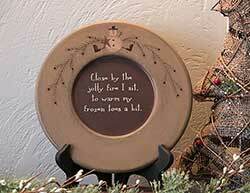 Cold Twigs, Warm Heart Plate, by The Hearthside Collection. 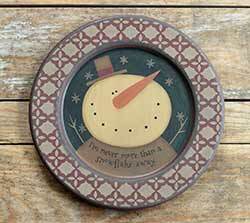 This wooden decorative plate features a painted tree, snowman, and snowflakes against a light blue background. 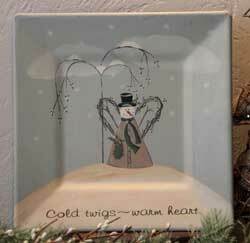 Reads: "Cold Twigs - Warm Heart." Measures approx 10.25 inches. 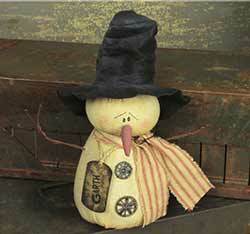 Made of hand-painted pressed wood, antiqued and distressed for an aged, rustic look. 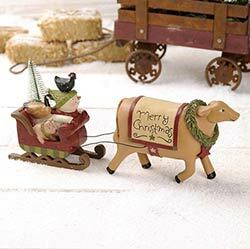 Decorative use only (not food safe). Stands also available, sold separately. Cut Felt Snowflake Ornament, by One Hundred 80 Degrees. 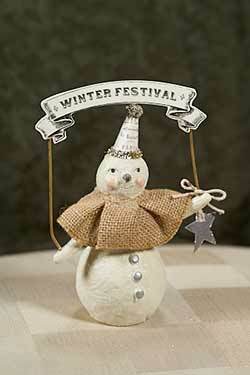 Cut, stiffened felt ornament in layered snowflake design. 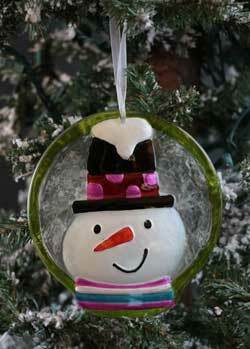 Wooden snowflake is painted white and lightly duest with glitter, and sandwiched between two cut pieces of stiffened felt. 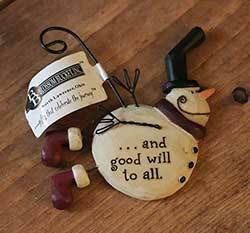 Sold individually (priced per snowflake ornament). Choose from left to right, the 1st, 2nd, 3rd, or 4th snowflake. Measures 3.5 inches. 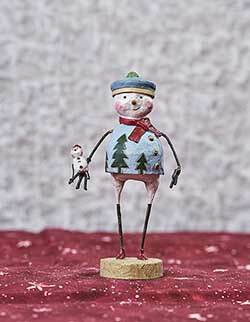 Made of wood, felt, and glitter. 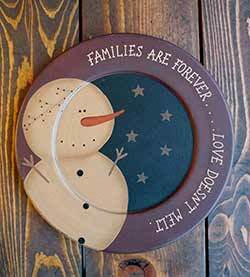 Perfect for a shelf, mantle, or perched on a wall hanger, this hand painted decorative wood plate adds a warm and cozy folk art touch to your home for the winter holiday season. 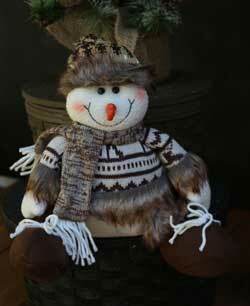 A country snowman decorates a charming feather tree in this piece of original artwork. 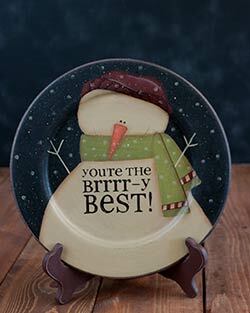 Families Are Forever Snowman Plate, by The Hearthside Collection. 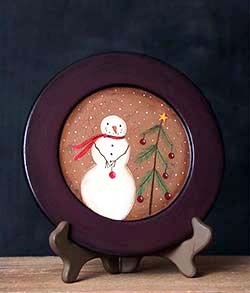 This primitive plate features painted snowman against a black background and burgundy rim. Reads "Families are forever...Love never melts" Measures approx 9.5 inches. 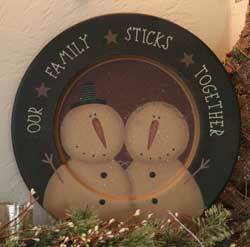 Large Families Sticks Together Snowman Plate, by The Hearthside Collection. 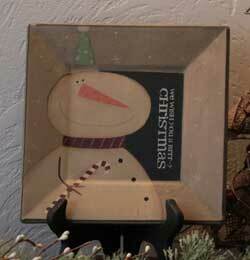 This extra-large primitive plate features painted snowman against a burgundy background and black rim. Reads "Our family sticks together." This primitive wooden tray features a sledding family of snowmen on a tan background, and reads "The family that plays together stays together." 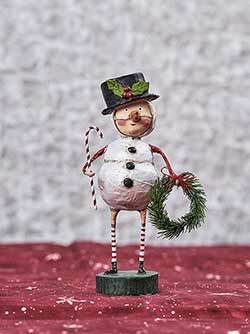 Fat Snowman with Pants, by Primitives by Kathy. 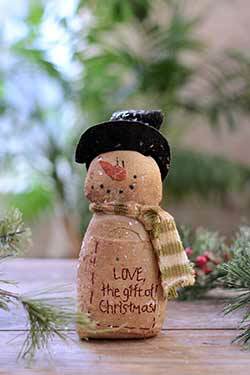 Quirky wooden snowman figure. A Dan DiPaolo design. Measures 18 inches. 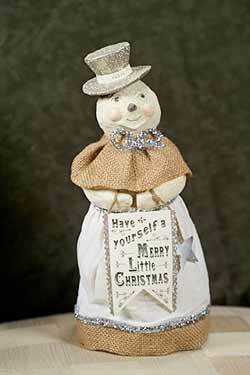 Flying Snowman with Saying Ornament, by Blossom Bucket. A Barbara Lloyd design. 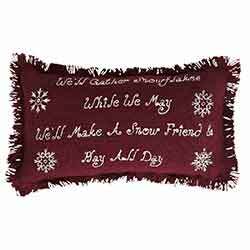 This one reads: "...and good will to all." Measures 2.25 x 2.75 inches. Made of resin and wire. 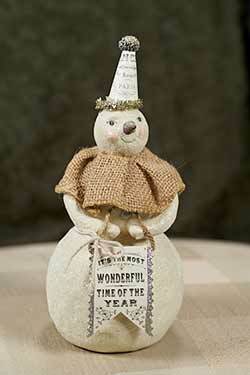 Flying Snowman with Saying Ornament, by Blossom Bucket. A Barbara Lloyd design. 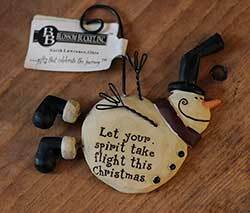 This one reads: Let your spirit take flight this Christmas. Measures 2.25 x 2.75 inches. Made of resin and wire. 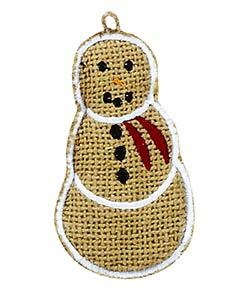 Flying Snowman with Saying Ornament, by Blossom Bucket. A Barbara Lloyd design. 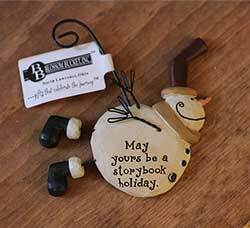 This one reads: May yours be a storybook holiday. Measures 2.25 x 2.75 inches. Made of resin and wire. 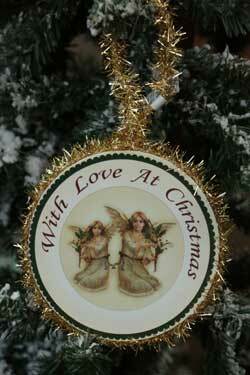 "Love the gift of Christmas.